Before we jump in: just a gentle reminder to please help me make sure I give you the recipes you want in 2016 by answering the quick 3 minute reader survey here! If you’re still searching for a crowd-pleasing appetizer to round out your New Year’s Eve party spread, say no more. I-slash-these-meatballs have you covered. 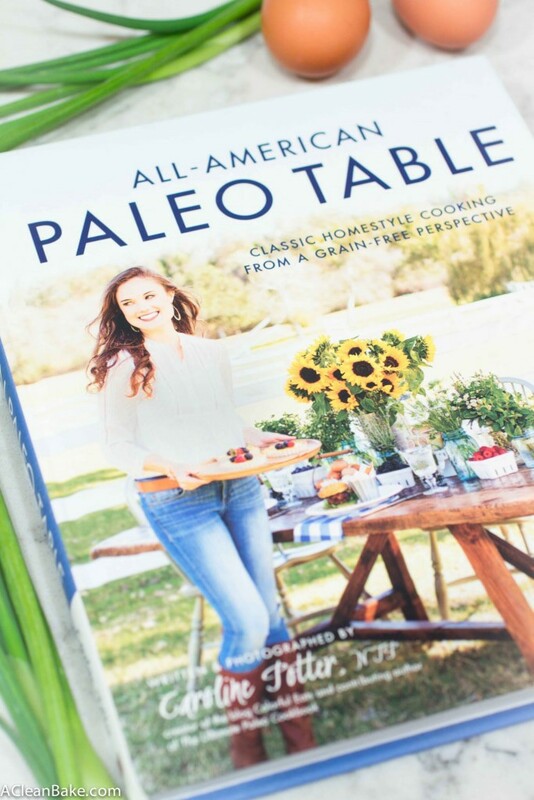 Actually, to be clear, my friend Caroline has you covered this holiday and practically every other that you can imagine, thanks to her beautiful and handy new cookbook The All-American Paleo Table. We’ll talk beautiful cookbooks in a moment, but first, let’s talk meatballs. And parties. And appetizers. With all due respect to every home cook out there who slaves over a beautiful meal for their guests, I have to admit that the appetizers are always the best part of every meal. Whether to quell hunger, lay a base for a few glasses of wine, or just keep your hands busy (small talk + hands = awkward, amiright? 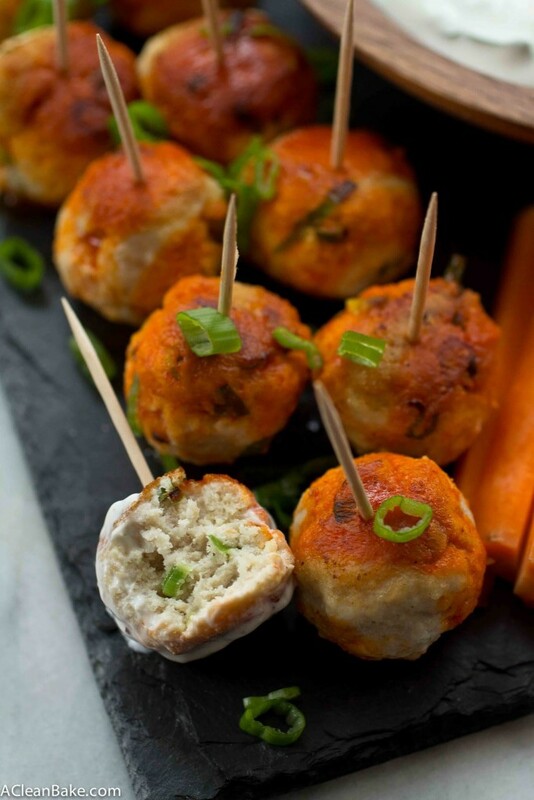 ), appetizers are the hero of the party. And we have all been guilty of filling up on them and leaving too little room for the main event, so best to make sure they are satisfying. 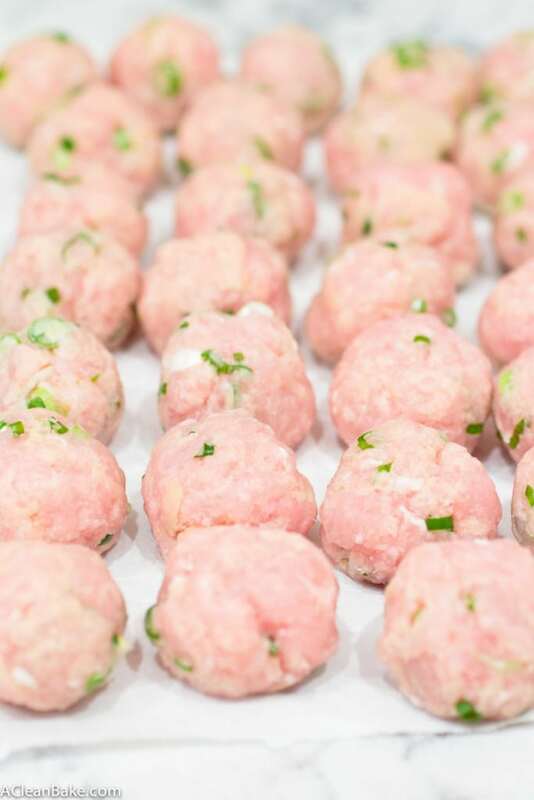 These meatballs totally fit the bill – believe me – and only go to show what a true celebration maven Caroline really is. 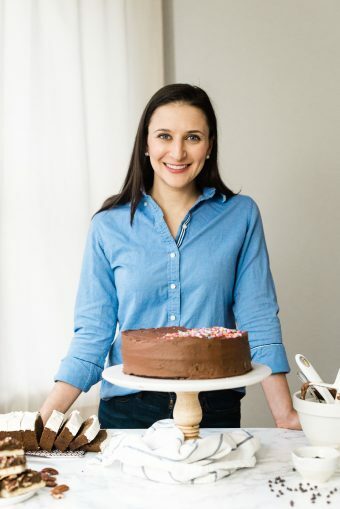 Exhibit A: She literally wrote the book on grain free and refined sugar-free holiday food. The All American Paleo Table gracefully walks the line between elegant flavor and presentation and familiar comfort food with dishes like roasted strawberry snickerdoodle ice cream sandwiches, coconut fried shrimp with mango habanero dipping sauce, cider mill doughnut holes, and reverse-seared herb and garlic crusted beef tenderloin. 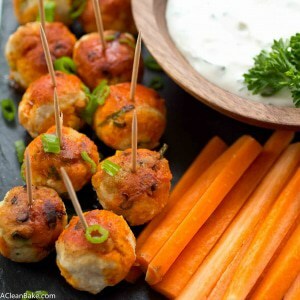 And, of course, buffalo chicken meatballs. The book is divided by event (rather than course), and these fall under the category of Game Day Eats, but they could be considered Any Party Fare or, in my house, Dinner. We inhaled them in record time, leaving behind a teetering tower of toothpicks seemingly still shaking slightly from the speed and gusto with which we built it. Which is to say the staggering rate at which we inhaled these little meatballs. Caroline makes them larger in the book, but I couldn’t think of a better way to ring in the new year than tiny meatballs on a stick, coated in just enough buffalo sauce to gently sear the back of your throat, and dipped in a creamy, cooling homemade ranch sauce that quickly soothes said sear. It really would be a shame to usher in the new year with anything less than a tidal wave of flavor, wouldn’t it? Happy new year, friends. See you in 2016! Preheat the oven to 350F and warm a large nonstick skillet to medium heat. Make the meatballs: In the bottom of a mixing bowl, sift together the almond flour, salt and garlic. Add the ground chicken and green onions. Use your hands to mix the ingredients together, but be careful not to over mix (the chicken will become gummy). Portion the meat into Tablespoons. Roll each into a ball and set aside on a plate. Once all the chicken has been made into meatballs, drizzle the olive oil into the warm skillet, swirling around to coat all sides of the skillet. Sear the meatballs for 4-5 minutes, flipping about halfway through. They will not brown completely; flip or remove from the pan when a crust just starts to form. You may have to do this in two batches. Once the meatballs are seared, transfer them to a baking dish that just fits them all (i.e. don't space them out) and pour the buffalo sauce over them. Bake for 10-15 minutes until cooked through. While the meatballs are baking, make the ranch dipping sauce by whisking together all of the ingredients. 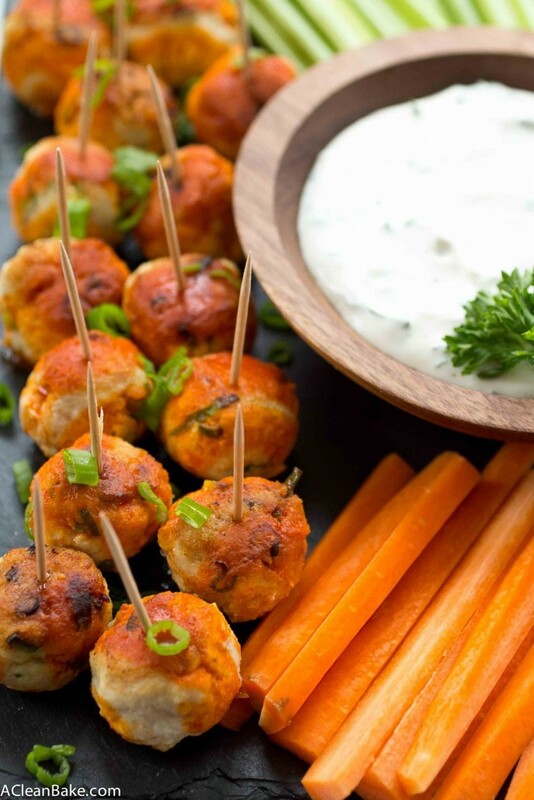 To serve, skewer each meatball with a toothpick, and place them on a bed of arugula, sprinkled with blue cheese crumbles (if using). Finish off the presentation with a bowl of the ranch sauce and the celery and carrot sticks. If you have trouble finding ground chicken, you can use ground turkey instead. Either way, avoid using the extra lean kind, which will produce dry meatballs. Both Caroline and I recommend using Frank's buffalo hot sauce. Unlike many condiments, it is sugar free! The original recipe calls for mayonnaise as the base of the ranch dressing, but I used sour cream instead and prefer it. Yield: About 55 Meatballs. Note that the recipe calls for making them larger - about 3-4 Tablespoons of meat per ball - and yields 16. This recipe originally appeared in The All American Paleo Table, and has been reprinted with the permission of the author.